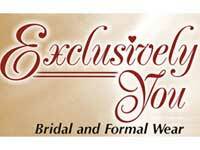 Exclusively You Bridal and Formal Wear, owned by Kimberly Angelo Keck, is located in downtown Bloomsburg. Our intimate shop and friendly staff will ensure that you look and feel beautiful on your big day. We carry a wide range of designers and styles for a wide variety of occasions; please check out our Designers page for more information. Don’t foget about accessories! We have jewelry, shoes, and other accessories to complete your look. Alterations are also done right here in our store. Feel free to contact us during our business hours with any questions. Bridal appointments are appreciated. Walk-ins are welcome subject to space availability.